A new type of non-volatile memory known as Nano-RAM (NRAM) -- it's based on carbon nanotube and sports DRAM speed -- is now being produced in seven fabrication plants in various parts of the world. According to Nantero, the company that invented NRAM, it also has more than a dozen corporate customers lined up to begin experimenting with the memory once it begins rolling off production lines. "So those fabs have been and are indeed producing large numbers of wafers and chips," said Greg Schmergel, CEO of Nantero. "They are sample chips/test chips in preparation for mass production, which requires the product designs to be completed." Schmergel said it will likely take a couple more years before NRAM drives begin rolling off production lines. 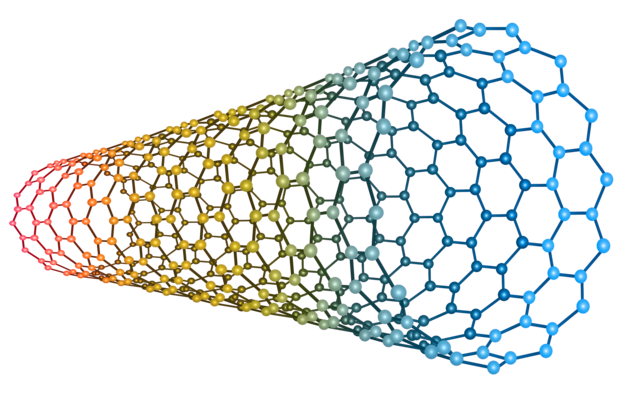 The geometric construct of a carbon nanotube. "This is one of very few technologies that's moved beyond the research lab into high-volume manufacturing CMOS facilities," Greg Wong, principal analyst at Forward Insights, said in a statement. "NRAM's unique combination of high speed and high endurance has the potential to enable innovative products in a host of consumer and enterprise applications." NRAM has the potential to create memory that is vastly more dense that NAND flash, which is used to make thumb drives and solid-state drives today. The densest NAND flash process today is near 15 nanometers. NRAM can reach densities of below 5 nanometers, according to Schmergel. NRAM is up against an abundant field of new memory technologies that are expected to challenge NAND flash in speed, endurance and capacity, according to Jim Handy, principal analyst with semiconductor research firm Objective Analysis. For example, Ferroelectric RAM (FRAM) has shipped in high volume, IBM has developed Racetrack Memory, Intel, IBM and Numonyx have all produced Phase-Change Memory (PCM), Magnetoresistive Random-Access Memory (MRAM) has been under development since the 1990s, Hewlett-Packard and Hynix have been developing ReRAM also called Memristor, and Infineon Technologies has been developing Conductive-Bridging RAM (CBRAM). "It’s really very difficult to project which horse will win the race to become the replacement for NAND flash and DRAM in 2023 or so when we anticipate that change, this juncture is so far off," Handy said. 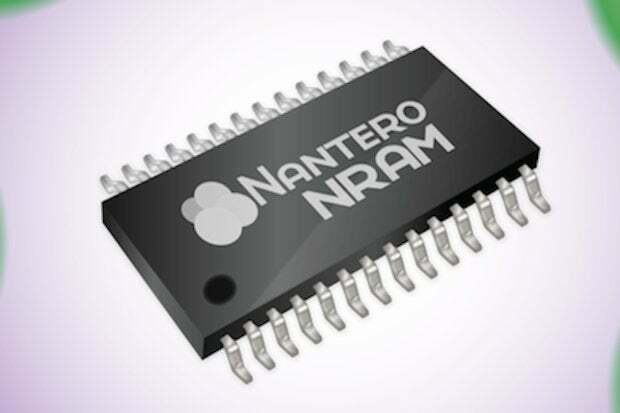 Over the past two years, Nantero has been able to reduce NRAM production costs 10-fold, making it compatible with complementary metal-oxide-semiconductor (CMOS), the standard used for making microprocessors and DRAM. One big advantage NRAM has over traditional NAND flash is its resistance to heat. It can withstand up to 300 degrees Celsius. Nantero claims its memory can last thousands of years at 85 degrees Celcius and has been tested at 300 degrees Celsius for 10 years. Not one bit of data was lost. 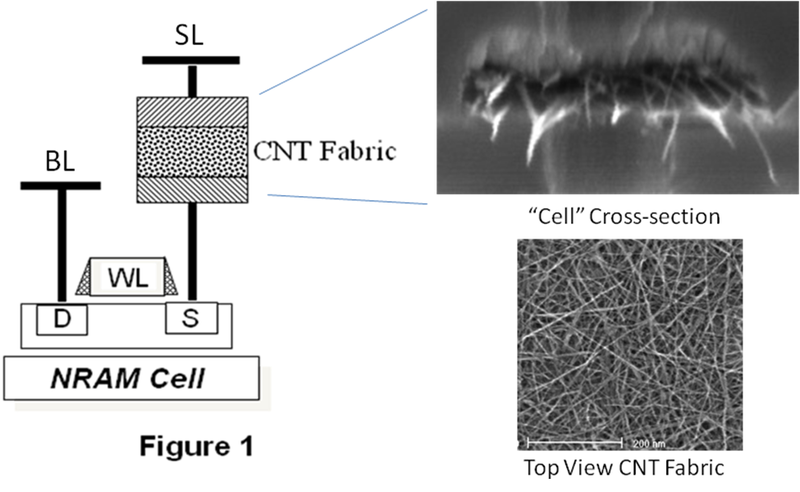 An illustration of the NRAM cell (left) and photos taken of the carbon nanotube fabric with an electronmicroscop (right). Anpther advantage is that NRAM is being built using the DDR4 specification interface, so it could sport up to 3.2 billion data transfers per second or 2,400 Mbps -- more than twice as fast as NAND flash. Natively, however, the NRAM's read/write capability is thousands of times faster than NAND flash, Schmergel said; the bottleneck is the computer BUS interface. 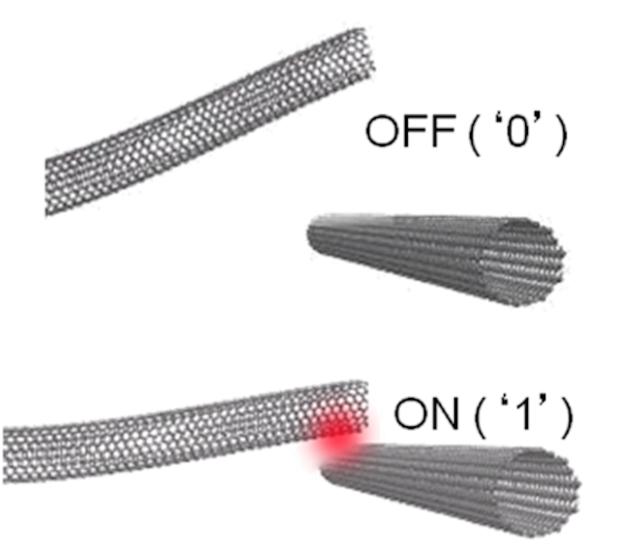 "Nanotube switch [states] in picoseconds -- going off to on and on to off," Schmergal said. A picosecond is one trillionth of a second. Carbon nanotubes are strong -- very strong. In fact, they're 50 times stronger than steel, and they're only 1/50,000th the size a human hair. Because of carbon nanotubes' strength, NRAM has far greater write endurance compared to NAND flash. The best NAND flash, with error correction code, can withstand about 100,000 erase-write cycles. According to Nantero, NRAM can withstand 1012 write cycles and 1015 read cycles -- an almost infinite number. "Heat and vibration also will not cause errors," Schmergel said. Carbon nanotubes are grown from catalyst particles -- most commonly iron. NRAM is made up of an interlocking fabric matrix of carbon nanotubes that can either be touching or slightly separated. Each NRAM "cell" or transistor is made up the network of the carbon nanotubes that exist between two metal electrodes. The memory acts the same way as other resistive non-volatile RAM technologies. Carbon nanotubes that are not in contact with each other are in the high resistance state that represents the "off" or "0" state. When the carbon nanotube contact each other, they take on the low-resistance state of "on" or "1." An illustration showing the two states of NRAM, where one carbon nanotube is either touching another, creaing a low reisistance or "on" state; the other, where the tubes are not touching, creating a high resistance or "off" state. Over the past few months, Nantero has hired more than a dozen chip design engineers who are working to create high density circuits, including three dimensional or stacked designs for increased capacity. "If you're taking a gum stick, then your talking about many gigabytes of capacity -- terabytes in the future," Schmergel said. Nantero doesn't plan on producing its own NRAM drives, which will initially be marketed for purposes similar to solid-state drive (SSD) gum sticks or internal memory boards. But it will license its intellectual property to companies to develop their own product. Nantero's engineers are still in the process of creating chip designs for the memory wafers. Because of its resilience to heat, vibration and pressure, Nantero's carbon nanotube memory has caught the eye of aerospace giant Lockheed Martin and Schlumberger Ltd., the world's largest gas and oil exploration and drilling company; both companies are customers of Nantero. Nantero declined to name its other customers. "Clearly a company like [Schlumberger] would have need of memory that could perform in environments with very high heat down in an oil well," Schmerge said. Founded in 2001, Nantero has to date generated $78.1 million in five rounds of funding, including a series E round for $31.5 million that it just closed. The company also announced that the former vice president of Intel's Flash Memory Group, Stefan Lai, has joined the company as a technical advisor. Lai co-invented the EPROM (erasable programmable read only memory) flash memory cell and led the Intel's phase change memory (PCM) development team. "Nantero's NRAM has unique attributes that make it the most promising candidate to be the almost ideal memory: the nonvolatility of Flash, and the speed and functionality of DRAM with lower cost," Lai said. Nantaro also announced that Yaw Wen Hu, a former executive vice president at Inotera Memories, has also come on board as a technical advisor. Inotera, a Taiwan-based partner of Micron, supplies nearly 10% of the world's 300mm DRAM silicon wafers at its two fabrication facilities. "The availability of memory technology that is extremely fast, can deliver terabits of storage capacity in the future and consumes very little power, has the potential to change the future of electronics," said Alan, Niebel, CEO of Webfeet Research. "After researching NRAM for over twelve years, WebFeet applauds Nantero for reducing the costs of the CNTs in an NRAM chip by 10x in the last two years, making NRAM CMOS compatible and finally proving NRAM viability with commercial production capability from its licensees."